The Internet of Things (IoT) offers many opportunities and a new world of data management and security challenges for organizations. First, IoT changes the breadth of what we connect regarding the type of devices. The move to mobile and IoT means IT Managers must support a broad range of operating systems, various device protocols and multiple types of wireless networks. There is also a wide range of protocols and messaging systems that targets device data collection and messaging. One of the exciting areas of the IoT is its potential to change how we engage with technology and transact business. While the Machine to Machine (M2M) era focused mainly on the challenges of connecting devices, the IoT era concentrates on the opportunities presented to businesses who use connected data. This data can provide valuable context for business processes. By collecting and analyzing IoT data, groups within an organization can increase efficiencies with services such as predictive maintenance and route optimization. It can also improve the customer experience by supporting new service experiences such as omnichannel retail and smart home applications. 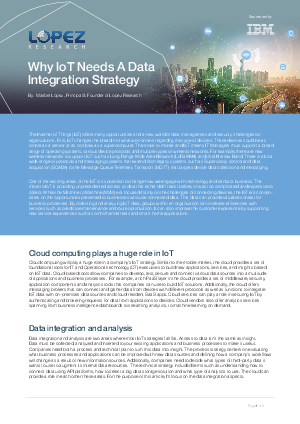 Read this report to learn more on the future of IoT.